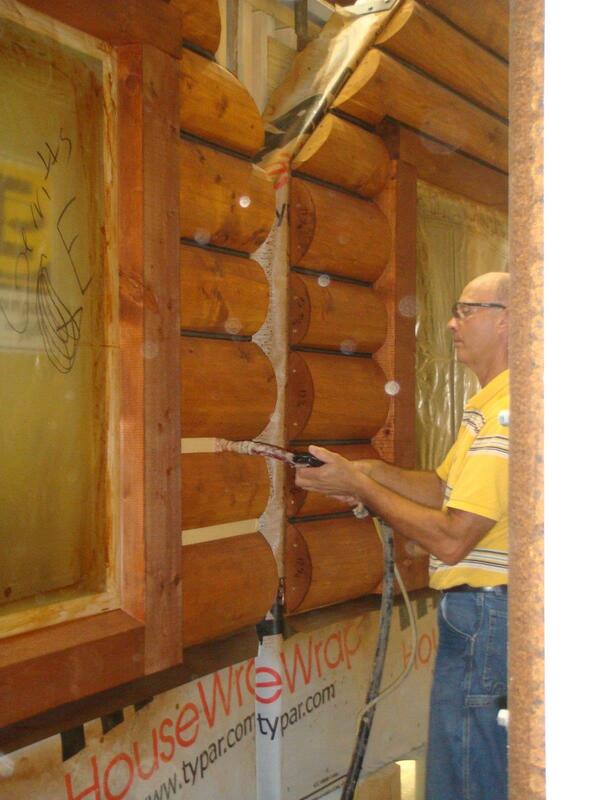 Here is how we produce our award winning panelized system built Whisper Creek Homes. 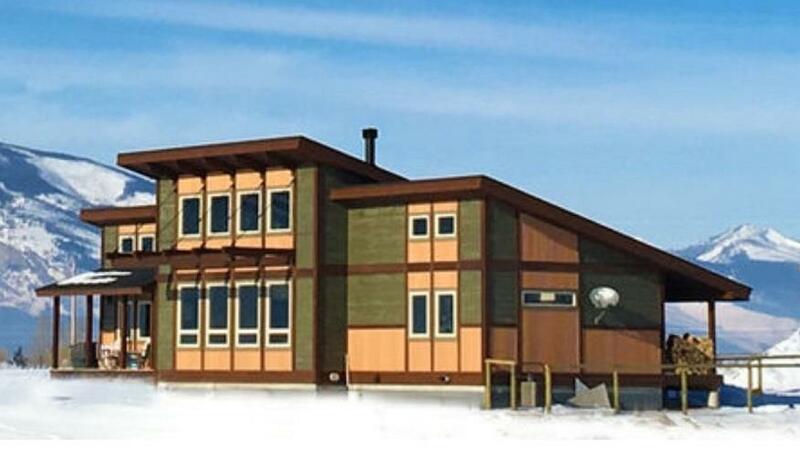 The 2017 panelized award winning home, featured here is our Eagle River lofted panelize wall constructed model. Panelized system built, craftsman style, log and timber homes are assembled quickly onsite with precision for a fast built, dried-in shell. We manufacture our high quality home packages made to order, in our indoor controlled environment construction framing facility. You may know what your insurance company has budgeted for replacement costs or you may need help with cost estimates. We can help. Let’s talk and I will make suggestions to create your vision! Design your plans. One of our designers will help you determine which of our flexible models, plan and options best matches your desired home. see link! 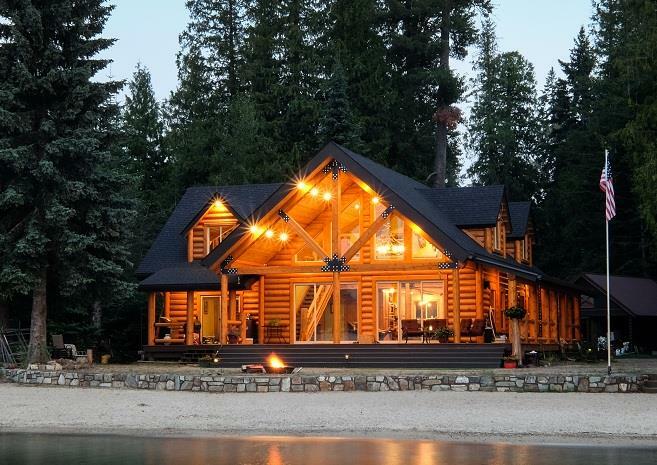 All models are available in single and two story designs with modern low maintenance exteriors as well as log and timber siding options. 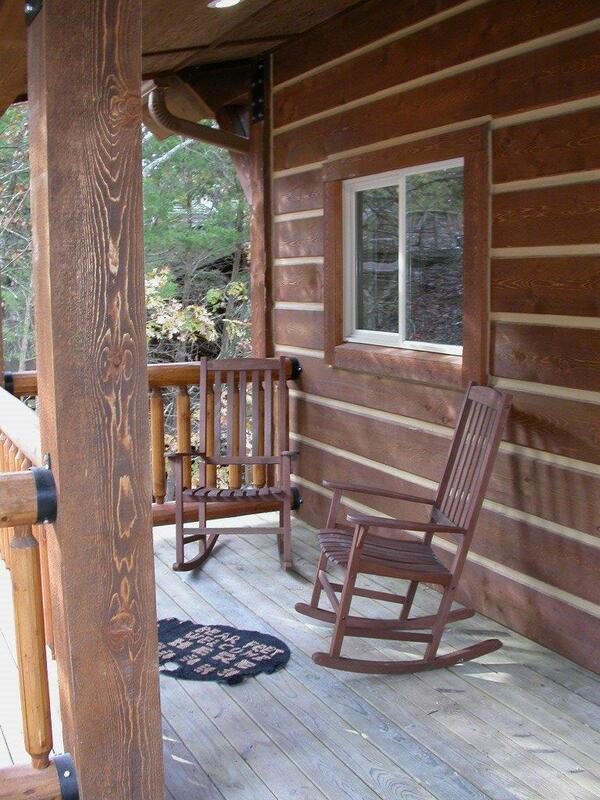 We produce the finished exterior walls, already sided with log or timber or craftsman style fire resistant exteriors. We provide Pella windows in all series and colors. We have an in-house design team who develop your blueprint plans & structural engineering. The design cost is "included" in the pricing structure that we quote to you for your home package! However, an additional design fee for current code engineering does apply. The building process made fast and easy. When you are happy with your model selection and design, you authorize a design contract and pay a plan deposit at around $7,000 which is applied to the quoted purchase price. In two to four weeks, you will receive a first draft of your plans for your review so that you can make any needed changes. approved them, we draft them into a Full Set of Plans. 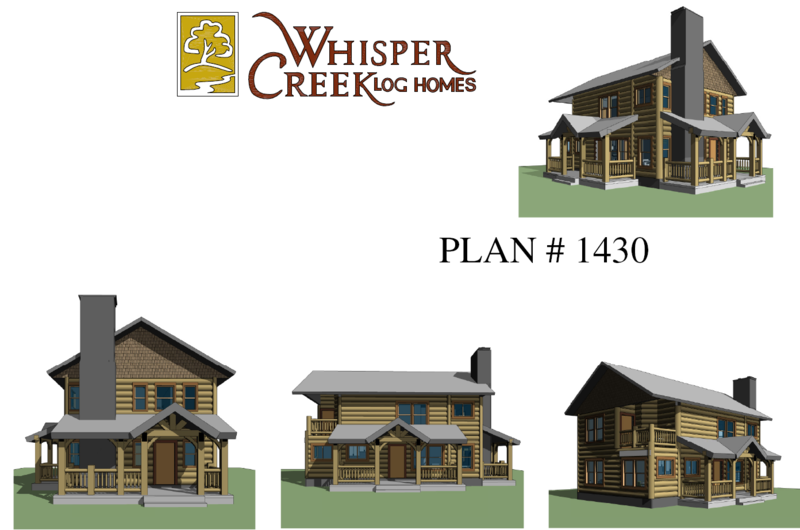 We then develop your Full Set of Plans to be compliant with the current California engineering code using a local independent structural engineering firm to review Whisper Creek Log Homes design and engineering, an additional fee may apply for the final engineering review. The Full Set of Plans enables the local contractors to price-out your site preparation, subcontractors’ bids, and interior finishes as well as arrange for all required permits. Included in your Full Set of Plans are a digital copy of architectural plans and three full sets of final approved wet- stamped blueprints ready to submit to your building department to obtain your building permit. The site plan is developed by an independent local civil engineer. 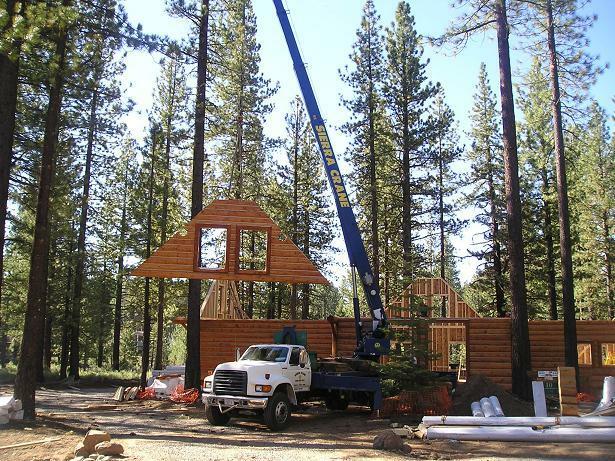 We use a local structural engineer for Green Code and Title 24 California requirements. With the contract, plans, and final specifications completed in Step 3, we are ready to begin building. A production date is scheduled for your custom package to be fabricated in our controlled facility. This requires a 50% package deposit. We begin building your home in our factory and provide you with a firm delivery date. 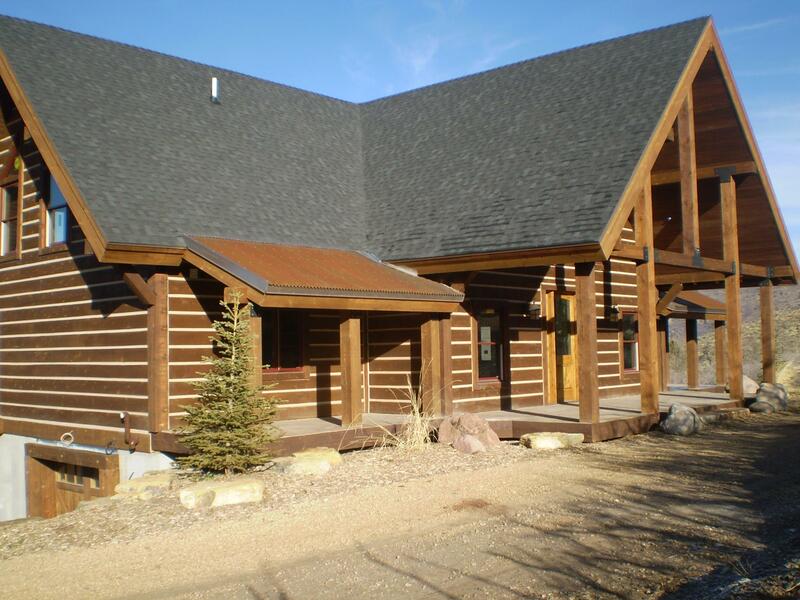 Production includes all exterior finished walls with windows installed and the siding of your choice applied in your style and color selection. Here is how we construct your home at our indoor quality- controlled manufacturing plant. Your contractor will set the foundation and subflooring preparation to receive the exterior structural package. Your home is shipped from our production plant when the sub-floor is complete and the contractor is ready to receive the home package. The final payment is placed in an escrow account until the delivery is complete and inventoried by your WCLH representaive, Norm Clover. 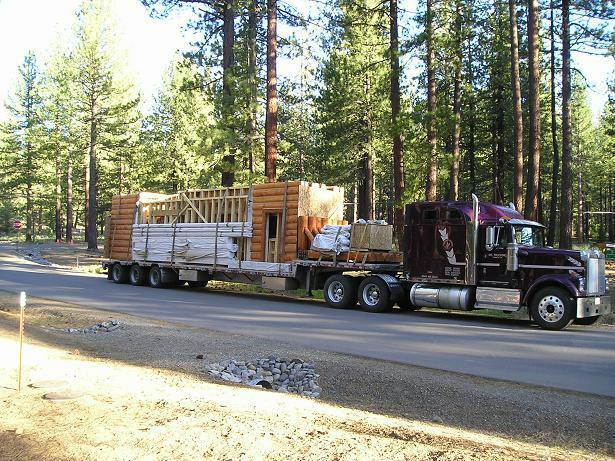 An independently insured trucking company is then arranged to deliver your home package. The delivery costs will be billed directly to you and is not part of our package quote. The structural package is delivered and then assembled on your prepared foundation/ sub floor by your contractor and built to a “lock-up” stage within days. 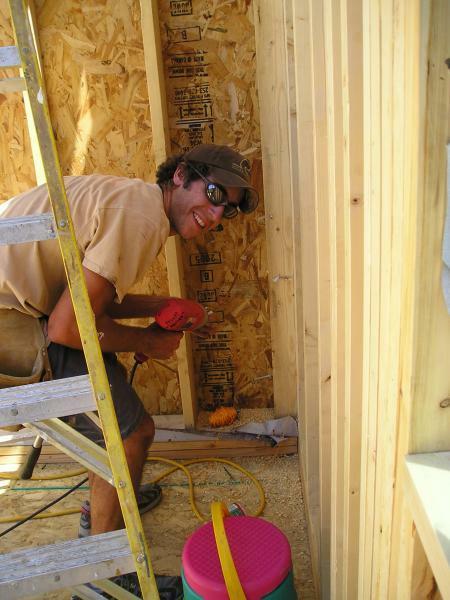 Norm Clover will be on-site to assist the contractor and crew with the assembly of the panelized home package into a weather tight shell. All of the walls are usually set in one day. We set one completly finished exterior wall at a time! Then, the roof is framed and sheeted and ready for the roofing contractor. Your contractor will then manage your project. Your turn-key home with complete interior finishes will involve several subcontractors and material suppliers. Your input and decisions determine the finishes and additional funds will be required! 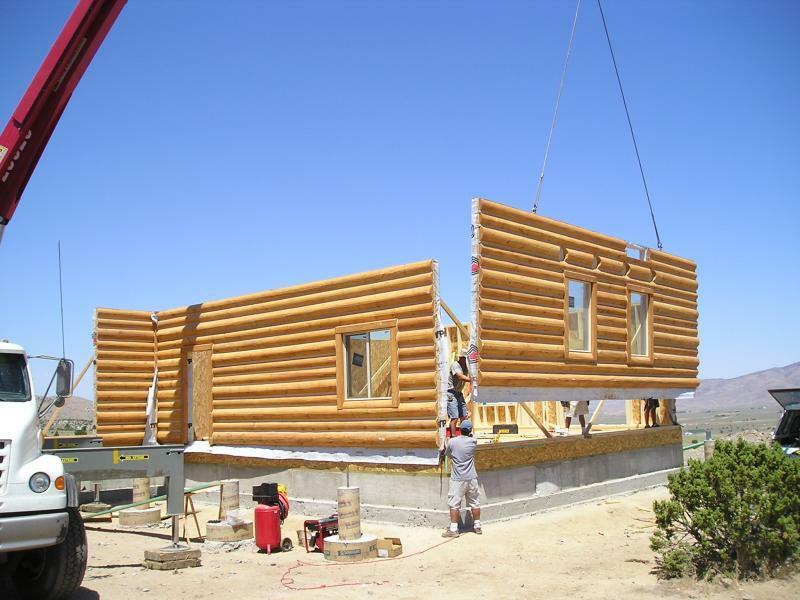 Our prebuilt, panelized homes can have the appearance of a traditional log and timber stacked homes without the inherent shortfalls. 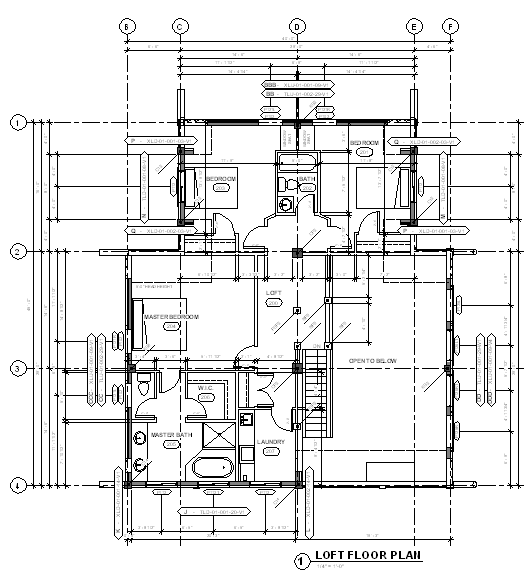 This eliminates shifting, cracking, checking and shrinking which can cause drafts and heat loss. 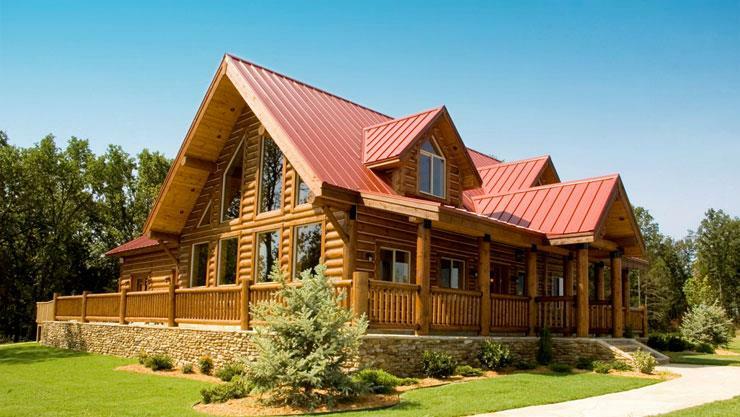 We also have a low maintenance class "A" fire resistant exterior siding. This product is a class "A" fire rated product! Armorshell warranty: Backed by the strength of a 50 year substrate warranty and a 15 year finish warranty, armorshell provides the armor for your home against nature’s worst. beauty for years of enjoyment. Step 1) Our Manufacture plant where we fabracate the homes. 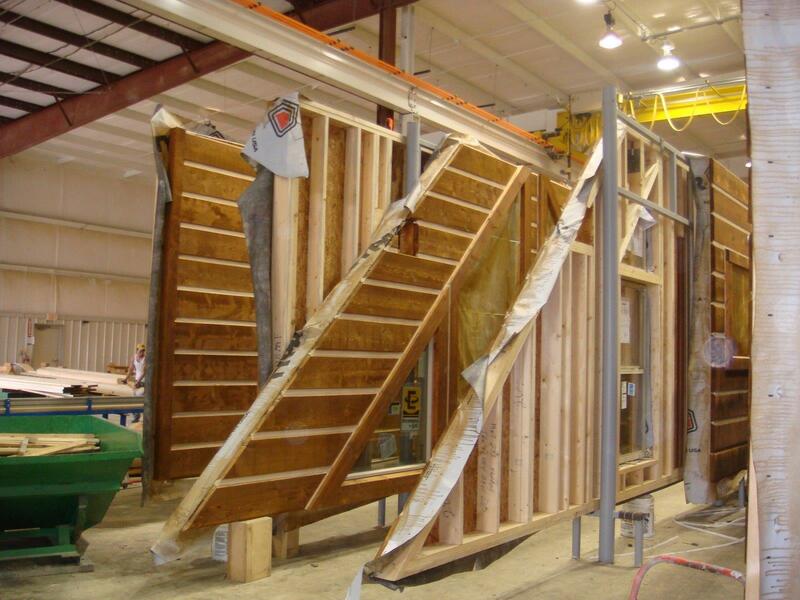 Our panelized wall fabrication system is shown below. Step 2) The orders come into the manufacturing plant and materials lists and cut tickets are produced. The lumber materials are cut and set on panelized template tables for precision framing. The panelized walls are framed according to your plans. 3) Then a sheer wall sheathing is nailed according to engineers specs for each wall panel and is be inspected and certified by an independent ICC certified inspector from Intertek. Then the house wrap is applied to the wall panels for full moisture barrier protection. Next we install Pella windows, they are set into the rough openings, wrapped and flashed into the openings and trimed out with 4"x6" rough sawn timber. 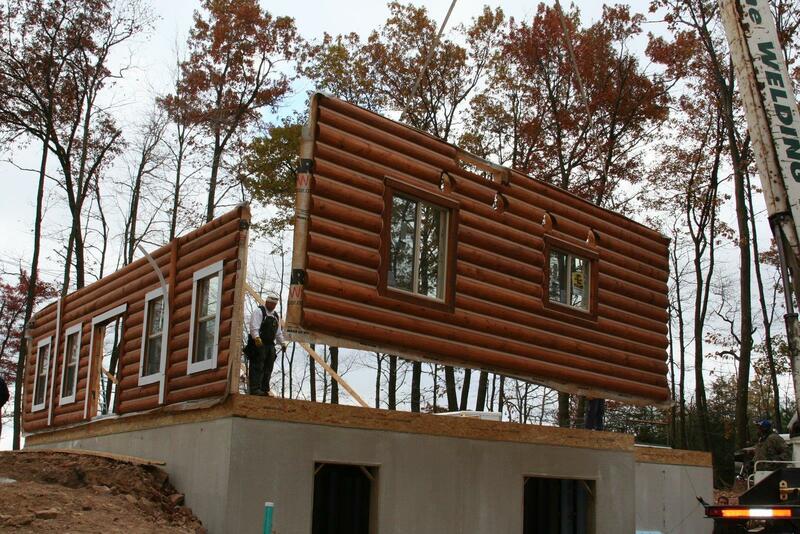 Seen below is a log style panelized home package. 4) Each custom built panelized wall is then sided with your choice of 12"timber plank , or the 8" & 10" hand hewn log siding materials. These materials are fastened to the panelized walls to the studs through the sheer wall with 3" coated screws. A third choice is the Armor Shell, low maintenance siding. 5) Next all exterior timber or log wall panels are stained with a Perma chink stain in our heat controlled indoor stain room. Then chinking is applied to of all the log and timber joints. 4) Meanwhile, on the other side of the manufacturing plant all structural log & timber components have been cut and prepped. They are sent to be stained to match the walls. All custom bracket and fasteners are packed and inventoried for each complete panelized structure package to be shipped. All logs, purling, timber stairs & railings are wrapped for protection and ready to be shipped along with the wall package. This is your panelized home package ready to be delivered. 5) Each panelized wall is loaded onto the delivery trucks standing vertically. Secured and shipped to your construction location. A Complete tour of the manufacturing plant is available by appointment if you choose to meet at our panelized facility. You are welcome to see our process in action. 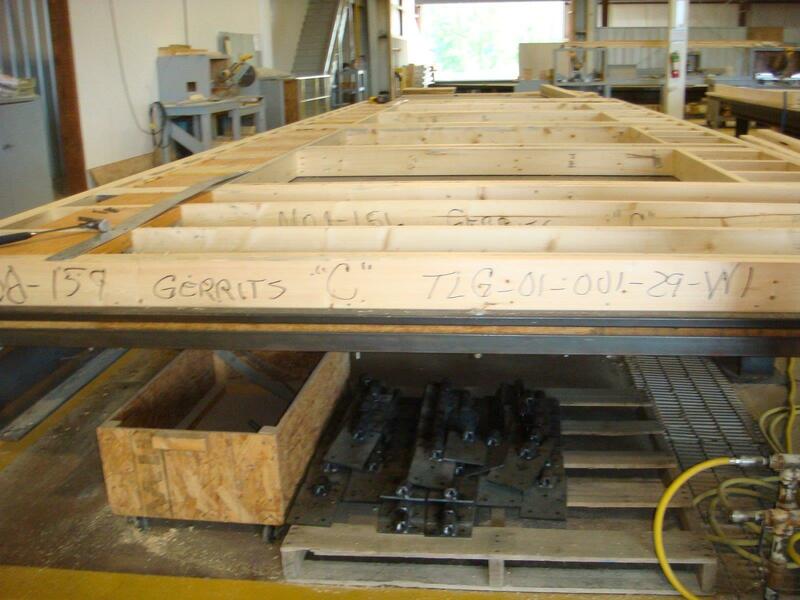 Come see our building panelized process for yourself! 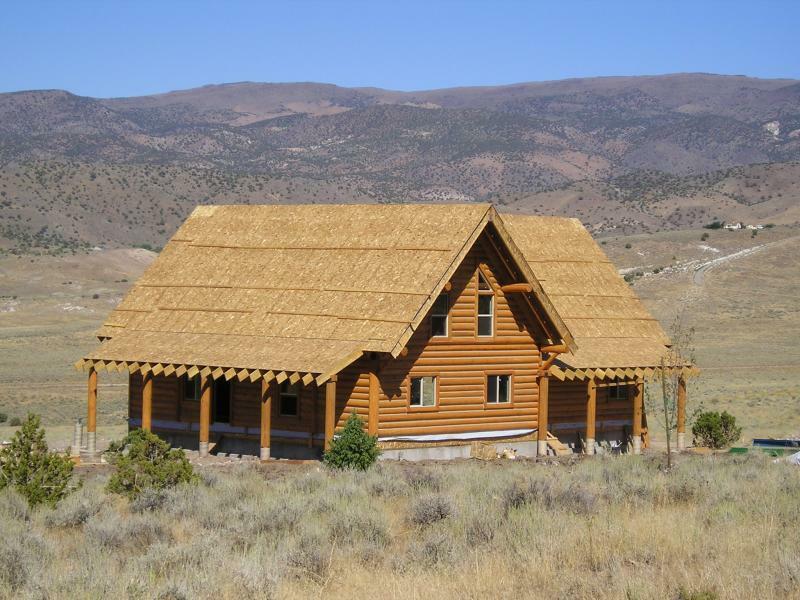 We provide structural handcrafted timber & log home kits that can be assembled quickly. Our pre-cut components are carefully inspected cut with precision and consistent quality. 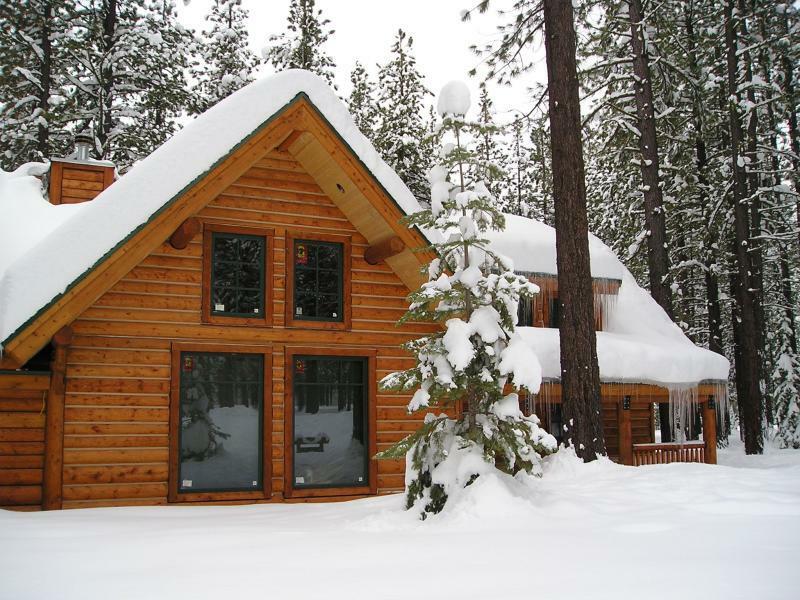 Our pre-built timber, log home kits save time & money compared with onsite construction methods of building and standard framing or stacked log home construction. This prebuilt panelized delivery system will provide you a home built in a controlled environment with quality craftsmanship. 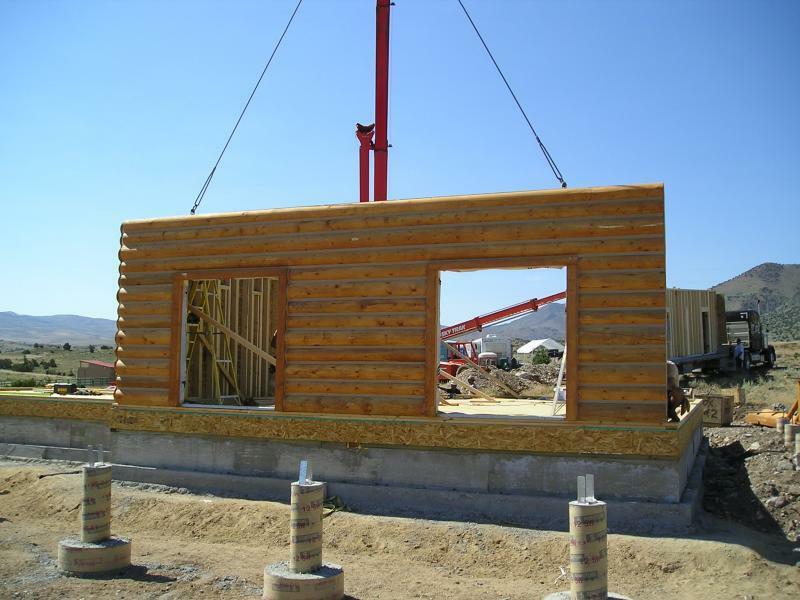 Construction time is reduced by using our quality panelized structural log & timber components. Onsite waste is greatly reduced as well, saving disposal cost to the builder and a major construction time and labor cost savings. 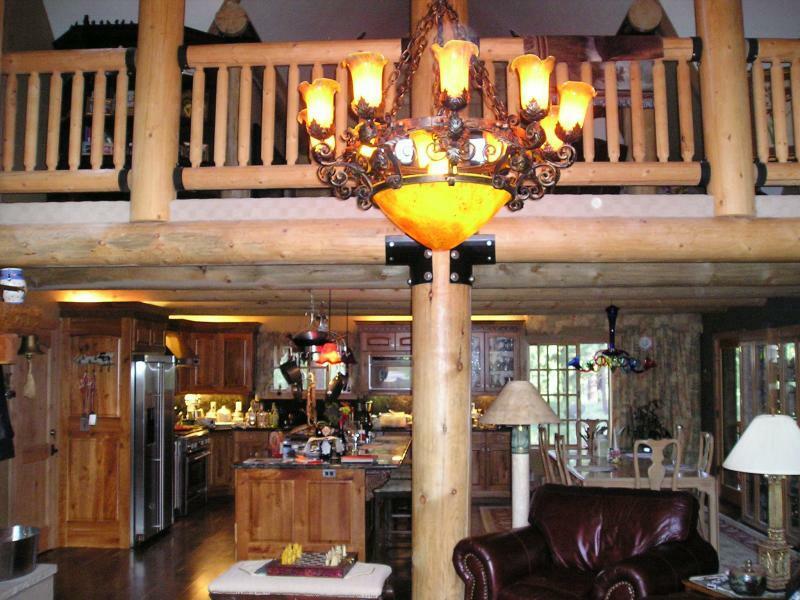 We provide floorplans and engineering in all 50 states in as little as two weeks. Our manufacturing plant is California HCD and ICC certified as required for panelized pre-built walls and inspection certified framed wall components. This makes building inspections go easily on the framed package. 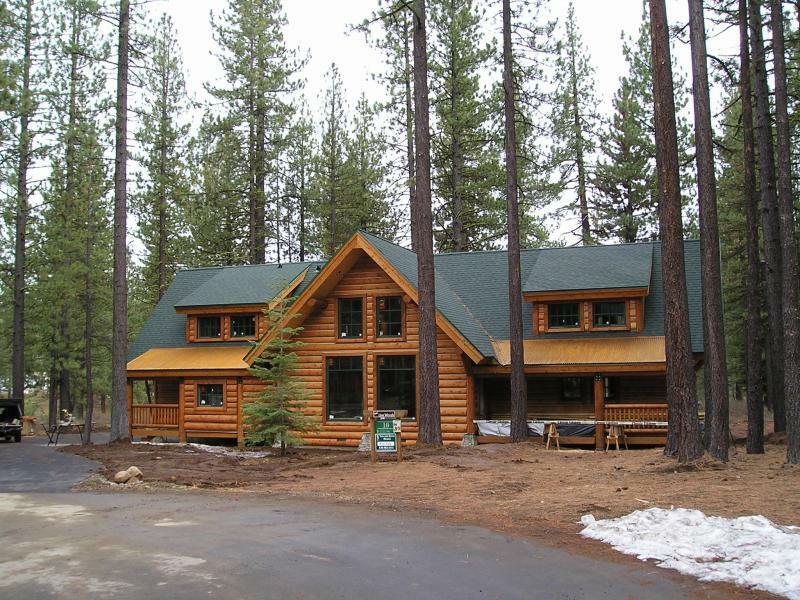 We are the only log home company that has been fire tested in accordance with the new Urban wildfire SFM code standards, and approved for California. 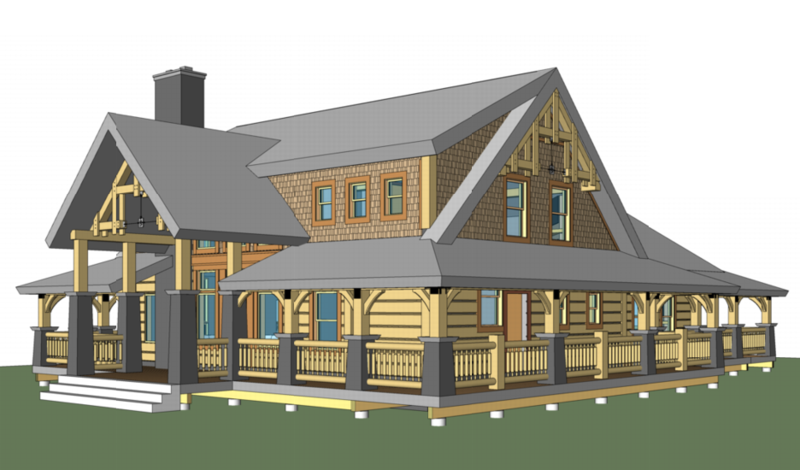 The Eagle River model shown below has had several options added, the full length running porch, two peak dormers, gable entry way and window feature wall along with the log railing. 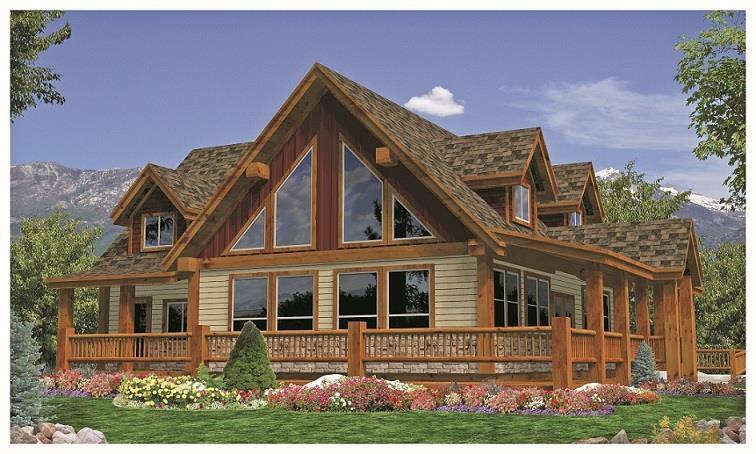 This is an example of the Eagle River model, floor plan. To view all of our models and floorplans, click on the link below! 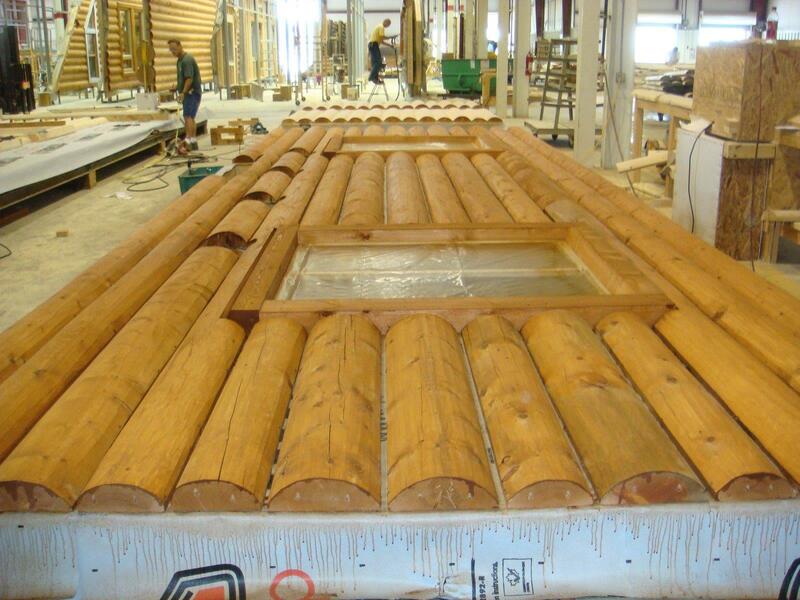 The assembly process below shows how easily your log home can be built with our panelized walls. 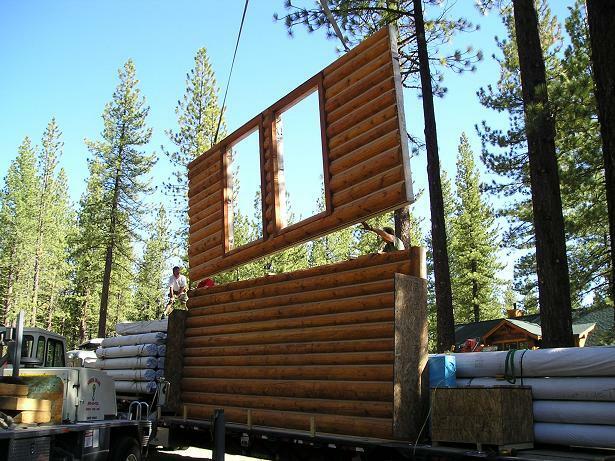 This is how the average log home kit goes up when using our panelized home kit. We begin the log home assembly process after the foundation has been poured. The sub floor has been built by your contractor according to our engineered plans. Day one begins with the delivery. The first panelized wall is then set. In just over an hour after the truck arrives. off of the truck using the crane. Each wall is set on the already finished subfloor, the walls labeled for their location of placment. Each wall is set and braced into its final position and lifted only once. The bottom plates are lag bolted down to the rim board at 16" O.C. with 6" bolts. 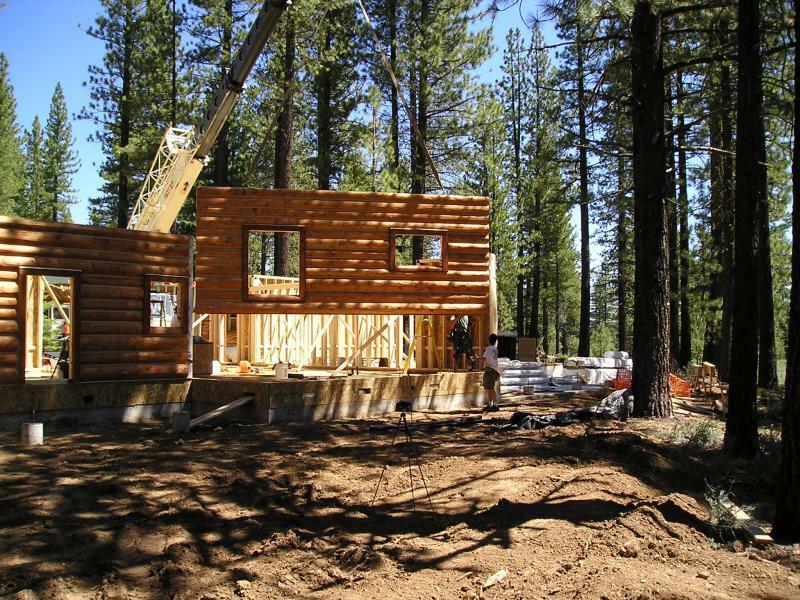 All of the main level walls of this log home kit have been assembled in place in three hours. Next we set the pre-built corner logs into position. These corner connections become the strength that help tie the walls together and supports the 4' overhanging gable rafters. Impact wrenches are used to drive the lag bolts easily. 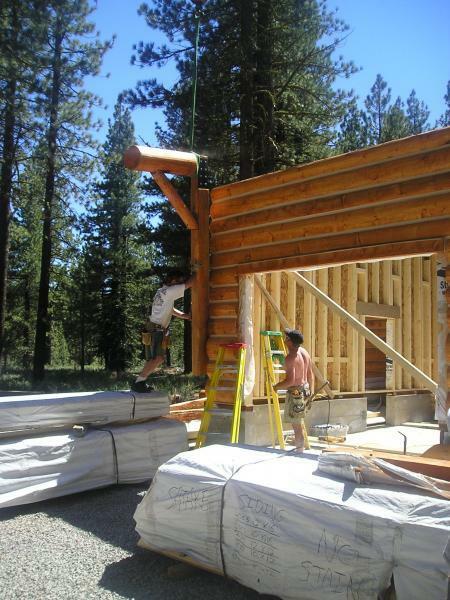 Having set all of the exterior log walls usually ends the assembly process for the first day. of all the log components. by a representative of Whisper Creek Developers. 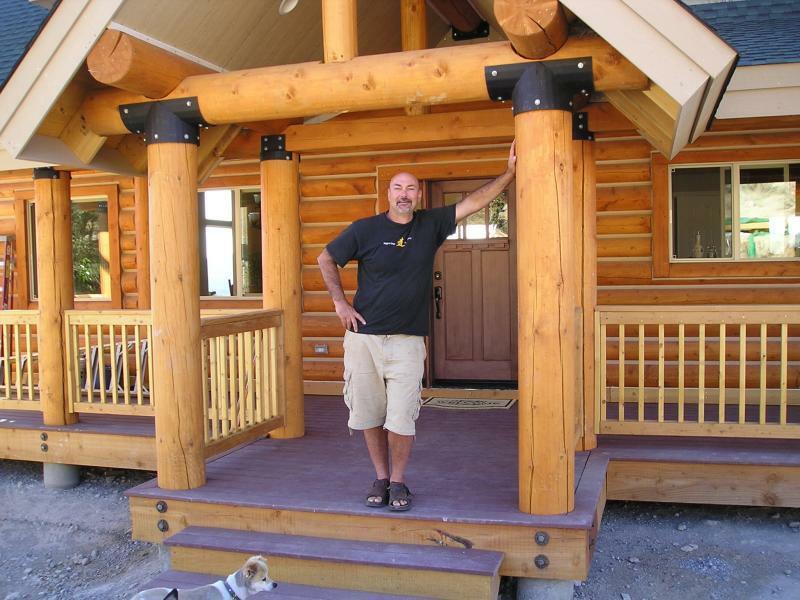 We inventory the delivery of your log home package and see that all materials have arrived. We will oversee that the walls go up correctly and consult the builder/ contractor on the assembly process. 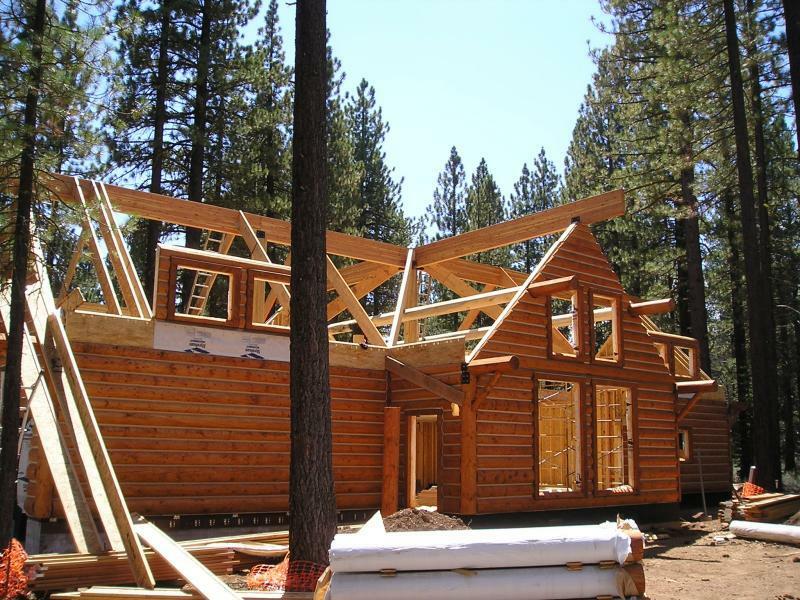 Shown below is an Elk Ridge model after 10 days of assembly and roof framing . Hud certified pre-built in our ICC certified panelized construction facility. For further information on pre-built panelized homes, contact Norm Clover. My parents lost their home of 46 years on Oct. 9th, 2017 to the massive wildfire in Glen Ellen, Sonoma County, California. We will be rebuilding their new home in 2018 with our single level Summit style panelized home package. We have customized the Summit to fit their specific needs inside and out. Rebuilding homes in Sonoma, Kenwood, Glen Ellen ,Santa Rosa, Napa and surrounding areas. Over 40% of today’s homes use factory-built panelized wall components. Panelized structurally engineered homes, built with regulated quality control. Our "panelized" packages include, all pre-built exterior wall panels with finished exteriors, pre-cut roof system, and complete "panelized" assembly plans... with pre-numbered wall panels for quick, easy installation and overseen and inventoried by a WCLH representative. "Panelized construction adds quality control to the home-building process,” says Lynn Gastineau of the National Association of Home Builders. For a E-Broshure with models and plans, contact us! 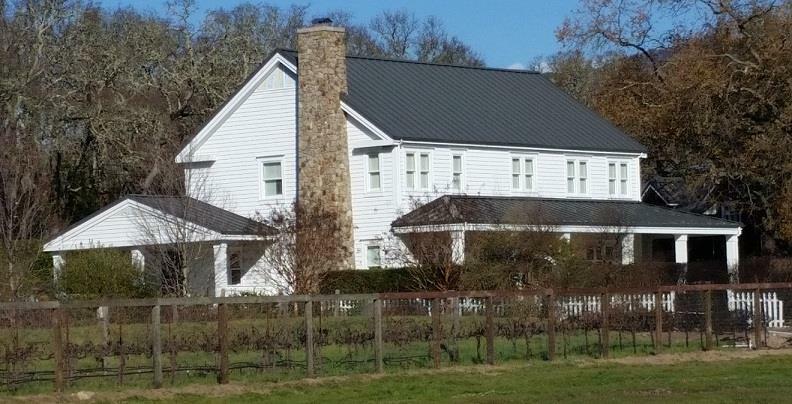 This Summer's, The Home Raising will be going on in Sonoma area, 248 Sylvia Drive Glen Ellen. This will be a modern designed home by WCLH. Assembly time is expected to take place in a period of 10 days! 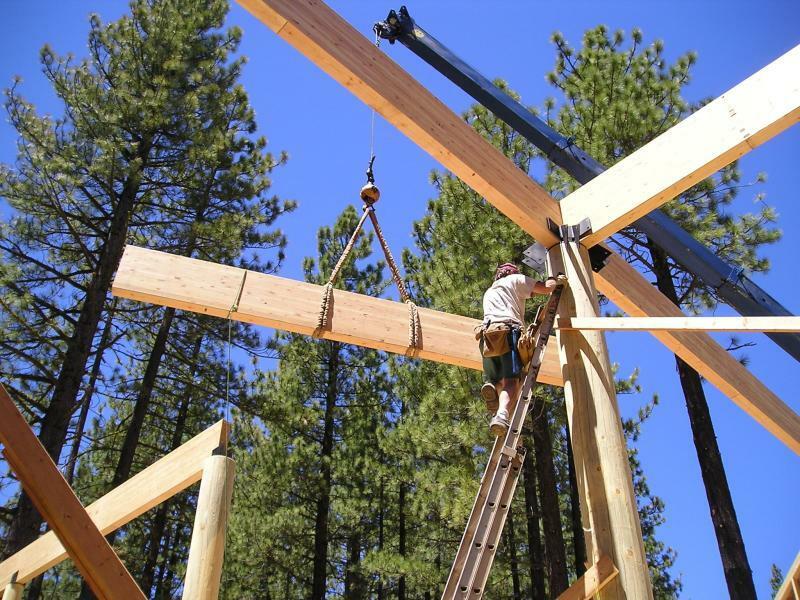 Another home will be raised near Carson City NV. 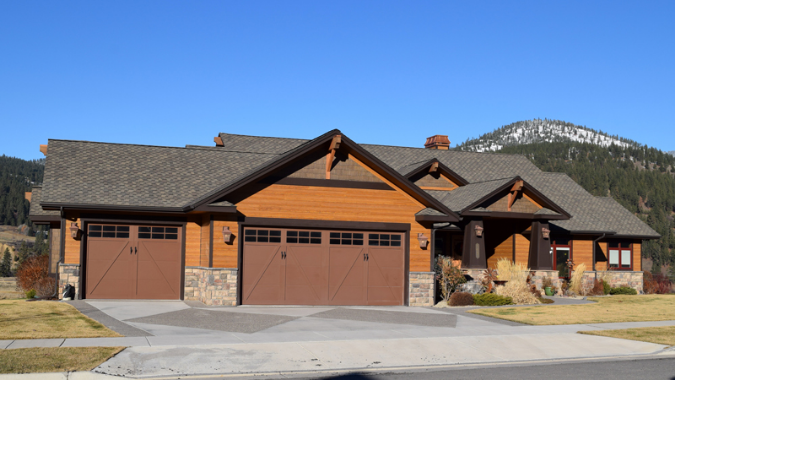 Our Elk Ridge model along with a three car garage. For more information call NormClover at 530 386 6225.